The South Bend Museum of Art is proud to host this exhibition of student work. Ivy Tech Community College’s School of Fine Art & Design (SOFAD)’s program in Visual Communication offers courses in graphic design, photography, web design, film & video, as well as drawing, painting, and three dimensional design. SOFAD’s Environmental Design program provides courses in interior design, sustainable building and construction, garden landscape design, kitchen and bath design, and the decorative arts. This exhibition contains SOFAD student work from the spring semester and exit portfolio preparation courses. 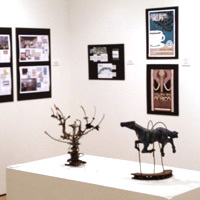 The students were requested to submit 1-2 of their best pieces to be considered for display. The faculty, all industry professionals and educators, have “vetted” the work by selecting pieces based on how well the students met the course objectives, creativity, and craftsmanship. Ivy Tech Community College’s School of Fine Art & Design (SOFAD) has an expansive mission to prepare students for a career in design, transfer to a four year university, advancement in their profession, or personal enrichment. This broad mission requires a comprehensive curriculum that allows students to experience the theoretical, technical, and applied aspects of the commercial and fine arts professions.